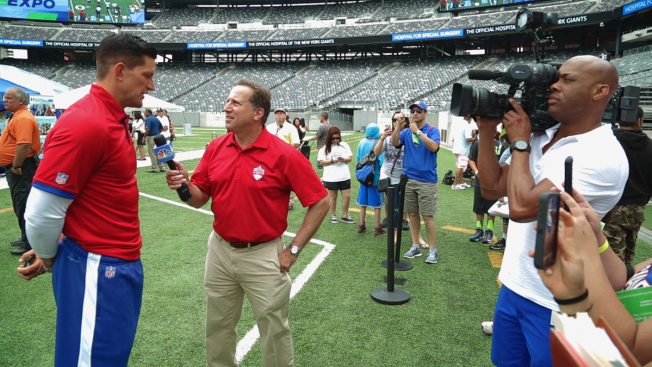 NBC New York sportscaster Bruce Beck at last year's Health & Fitness Expo. One of the largest and open-to-the-public health events, the Health & Fitness Expo is being held from 10 a.m. to 4 p.m. Saturday and Sunday at MetLife Stadium. Join NBC 4 New York's sports anchor Bruce Beck for this family friendly event! Walk the 50 yard line, tour the locker rooms, ride a zip line and meet a New York Giant! Plus, get free health screenings courtesy of Quest Diagnostics. May 14 and 15, 2016, at MetLife Stadium. Admission and parking are FREE. Come and meet our co-hosts, NBC 4’s Bruce Beck, Telemundo 47 sportscaster Veronica Contreras, New York Giants running back Rashad Jennings and Super Bowl XLVI champion Steve Weatherford, the fan-favorite former Giants punter. They’ll be there with other NBC 4 New York anchors and reporters. Other Big Blue players scheduled to appear include star wideout Victor Cruz, running back Shane Verezen; linebackers Mark Herzlich, Jasper Brinkley, Jonathan Casillas and J.T. Thomas; punter Brad Wing; nose tackle Damon Harrison; tight end Larry Donnell; wideout Geremy Davis; and long snapper Zak DeOssie. Olympic stars and competitors from “The Biggest Loser” and “Top Chef” will also be on hand for special events and to meet fans. More than 2,000 runners and walkers got together to aid in the battle against arthritis as part of the 2016 Walk to Cure Arthritis, which kicked off the expo. 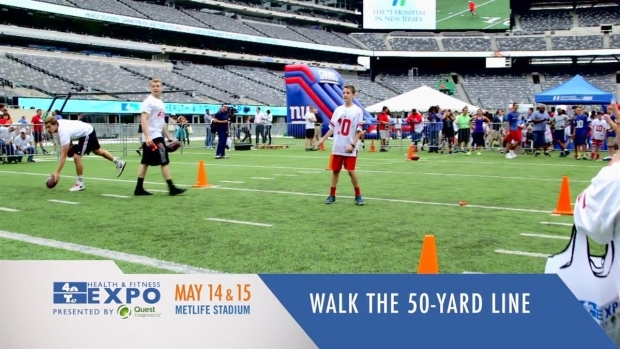 The Health & Fitness Expo will offer events and exhibits throughout MetLife Stadium, ranging from tests and screenings to fitness and safety activities. Quest Diagnostics will provide free health screenings to attendees 18-years and older. Tests include cholesterol, vitamin D and blood sugar level. Hackensack UMC Fitness & Wellness Powered by the Giants host Zen in the Zone, a mega yoga event on 9 a.m. Sunday, when thousands of people will practice yoga on the field of MetLife Stadium. Rashad Jennings will be among the participants. Fans are encouraged to bring their yoga mats, and the first 500 participants will get a free gift. RSVP here. Family Fun Zone will be open to attendees of all ages and will provide health and fitness information geared just for the kids! A variety of activities are aimed at teaching kids and adults about being healthy. Experts will meet with attendees and offer free health screenings. Free parking will be available at MetLife Stadium. Public Transportation: The Port Authority bus service will also provide transportation to and from the event. The 351 Bus Service will run hourly on Saturday and Sunday from 9 a.m. to 4 p.m. The buses will go from Port Authority Bus terminal (Gates 305 and 306) to MetLife Stadium Lot K. For more information, visit: www.351express.com.